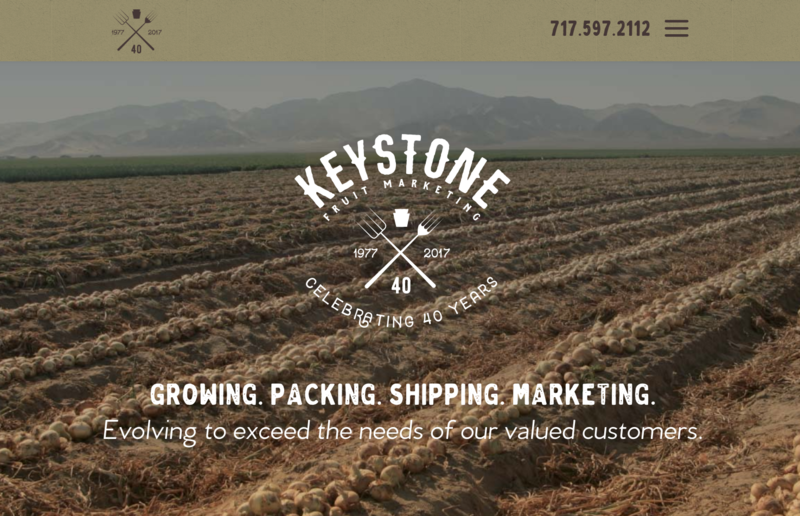 Keystone Fruit Marketing, Inc. is a grower, packer, shipper, and marketer devoted to seeing the fruit & produce industry flourish. Established in 1977, Keystone has always been committed to high standards of integrity, quality, and honesty when it comes to providing the freshest products. 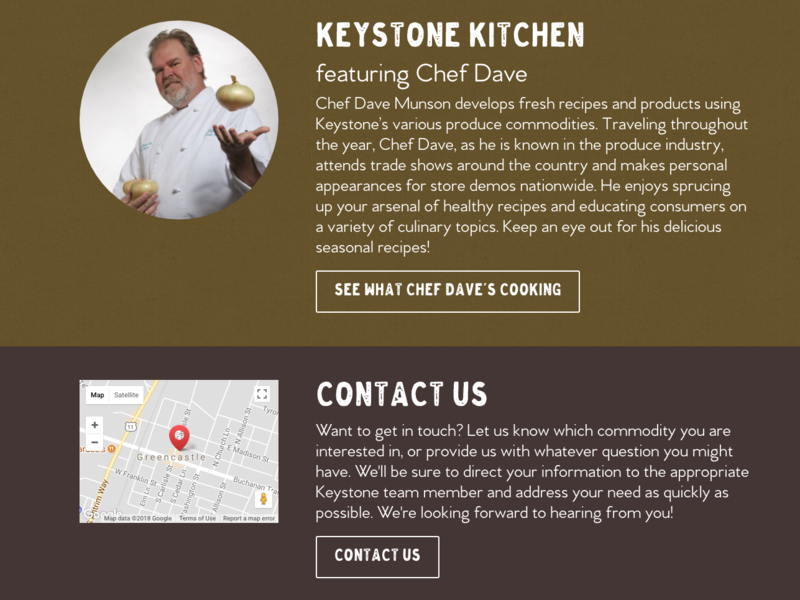 Keystone wanted to solidify their position in the industry through a visual brand overhaul and expansion of their website. The acquisition of a marketing manager facilitated the coordination and plannning to work on these website and branding efforts. Given that Keystone has never had consistent marketing strategy, it was paramount to consider the importance and not lose any part of the original brand and keep everything in mind. Keystone had never had materials or branding efforts that created a unified experience and confidence to their customers – the logo included. 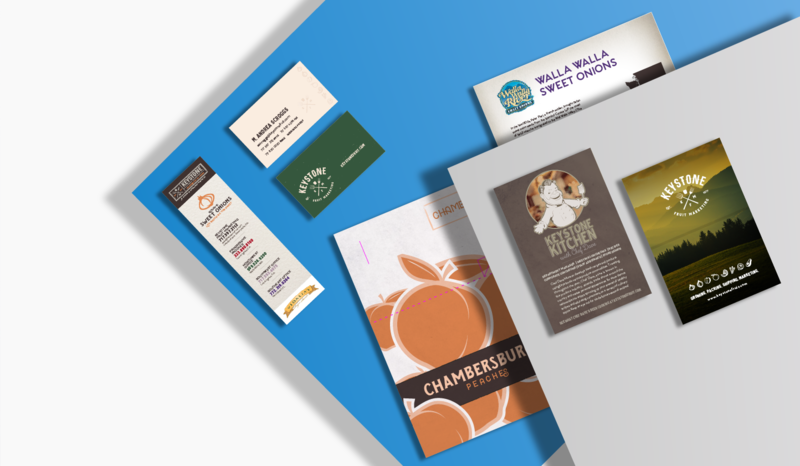 A crucial component was to create an identity and feel that was based on their target audience – commodity growers. It was important that the tone and feel was targeted at those businesses only, not for consumers visiting the site with the expectation to buy these commodities directly from Keystone. A secondary item based off that distinction is that Keystone markets for other growers, as well as grows their own commodities, so the brand must be flexibile enough to market their own commodities directly and show their partnership with their clients. By researching and discussing other industry examples, ORANGEHAT assisted to vocalize the need for the full rebrand and online presence to help get the approval to do everything. ORANGEHAT brought confidence and the tools to help achieve the need. Keystone now has what they have dubbed “real logo”. The rebrand has now enabled Keystone to create consistency in all their collateral and promotional materials. There is now an identity that pulled everything together, instead of everyone doing their own thing and not talking about it. It cleaned up and stablized their messaging and the communication. 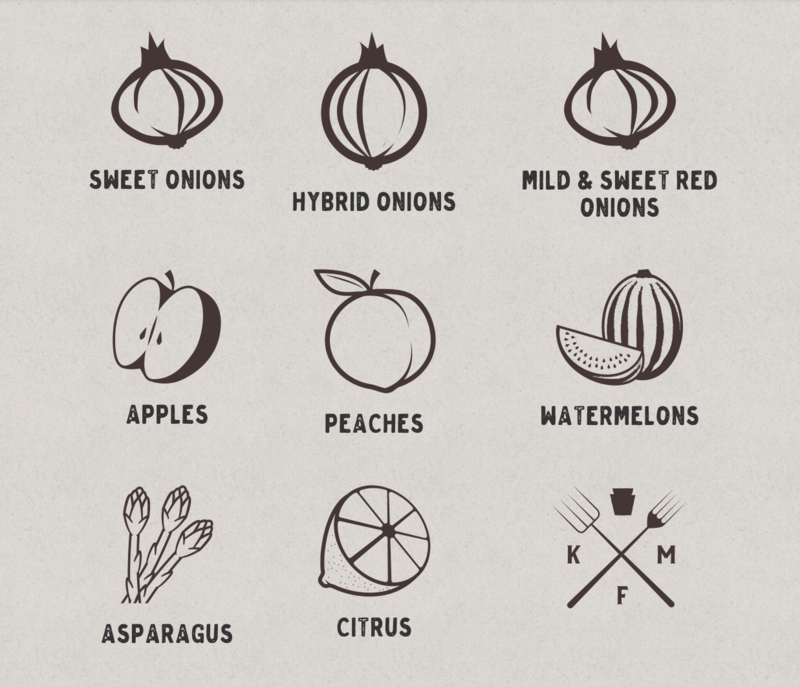 Based on their heritage, an organic looking brand was developed, blending a sense of professionalism and direct visual feel to their industry. The brand was developed with a primary and secondary set of logos. The main cross logo is the visual cue for any Keystone specific brand items. A seal logo was created to be “stamped” on any of their customer boxes, allowing their client branding to take precendence, while still giving Keystone a visual impact on those materials. The website focuses on information about their various customers, produce availability and other technical needs, important to a grower. The website and print collateral all have been based in this look to further support their message and identity. Currently, ORANGEHAT and Keystone are working on expanding the branding into their own commodity package design, deepening the impact of the brand and branching out, subtly, into the consumer space. ORANGEHAT HAS Been a really great resource and team to work with. communication throughout the entire process and made it comfortable to bounce ideas off each other. There was a great sense of collaboration throughout the project.